SoftPLC® is a registered trademark of SoftPLC Corporation located in Spicewood, Texas United States. The SoftPLC runtime is an embedded software program developed by SoftPLC Corporation. Ethernet/IP™ is a trademark of ODVA, Inc. This document describes the installation, usage, and functionality of the Ethernet/IP SoftPLC add-on module for the SoftPLC runtime. This software is a TOPDOC Loadable Module (TLM) that extends a SoftPLC runtime engine, enabling it to be a both a master/scanner and slave/adapter on one Ethernet/IP network. One ethernet interface is supported. The SoftPLC runtime engine software supports TLM’s, which are shared library extensions to SoftPLC. A TLM may be loaded either as a DRIVER or as a MODULE. The difference between a DRIVER and a MODULE is that a DRIVER is called once per SoftPLC scan cycle, and optionally an additional number of times per scan. A MODULE is only called when the control program decides to call it and not as an inherent part of the scan. TLM’s are made known to SoftPLC in the MODULES.LST file which may be edited by TOPDOC NexGen by traversing to: PLC ▸ Modules. This ETHER_IP TLM is a DRIVER and has a number of TOPDOC Loadable Instructions contained within it. These are Ladder Logic instructions that can be used to control or query the operation of the TLM. each i/o connection half may have its own RPI, size, target and originating assembly, and realtime format. Up to 20 target i/o connections in the form of exclusive owner. Up to 3 input only i/o connections. Up to 2 listen only i/o connections. I/O connections may be unicast or multicast. symbol class 0x6b instances, per Rockwell Automation publication 756-PM020D-EN-P - June 2016. This lets a SoftPLC runtime look like a Rockwell PLC to various HMIs. A descriptor tag may be exported as a CIP symbol and it is tied to a unique assembly instance when exported. Up to 1000 words per assembly. No explicit messaging client at this time, only server support as stated in Features above. The total number of I/O connection bytes is limited by the size of the SoftPLC runtime license, contact sales for details. Because of the variety of uses of the information described in this manual, the users of, and those responsible for applying this information must satisfy themselves as to the acceptability of each application and use of the information. In no event will SoftPLC Corporation be responsible or liable for its use, nor for any infringements of patents or other rights of third parties which may result from its use. SOFTPLC CORPORATION MAKES NO REPRESENTATIONS OR WARRANTIES WITH RESPECT TO THE CONTENTS HEREOF AND SPECIFICALLY DISCLAIMS ANY IMPLIED WARRANTIES OF MERCHANTABILITY OR FITNESS FOR ANY PARTICULAR PURPOSE. SoftPLC Corporation reserves the right to change product specifications at any time without notice. No part of this document may be reproduced by any means, nor translated, nor transmitted to any magnetic medium without the written consent of SoftPLC Corporation. SoftPLC, and TOPDOC are registered trademarks of SoftPLC Corporation. The TLM is in a file named ether_ip.tlm.so and the configuration file is named ETHER_IP.LST. These files will be pre-installed on your new SoftPLC for you. If you have an older SoftPLC, you can use SFTP to transfer the 2 above files to the /SoftPLC/tlm directory on the SoftPLC. To enable the TLM within the SoftPLC, use TOPDOC NexGen. Traverse to PLC ▸ Modules and select Use for ETHER_IP.TLM. There are no command line Options for this TLM (which would go into the fourth column if there were any). The Load button will load the MODULE.LST file from the development system’s disk. The Save button will write the MODULE.LST file to the development system’s disk. The Fetch button will load the MODULE.LST file from the runtime system’s disk. The Send button will write the MODULE.LST file to the runtime system’s disk. It is good practice to both Save and Send the edits, this way both your development system and the runtime get a copy. Whenever you Send the list of modules or the configuration file, you must restart or cycle power on the SoftPLC in order for the changes to take effect. To add your TLM to TOPDOC NexGen to enable it for use with offline editing, copy the ether_ip.tlm.so file into your <dev-sys-install-base>/SoftPLC/tlm/ directory (where <dev-sys-install-base> is where you have installed TOPDOC NexGen). The next step is to Configure the TLM. 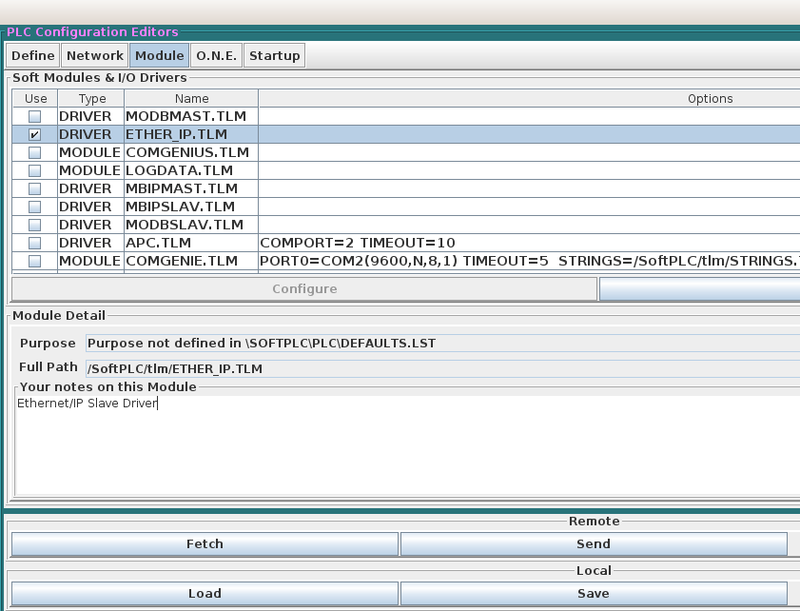 The detailed driver setup is done through the configuration file ETHER_IP.LST. Click the Configure button below the list of modules to edit the ETHER_IP.LST file (note that editing the configuration file in this manner requires a connection to the SoftPLC if you use either the Fetch or Send options). The default file is shown below - the comments in the file explain the format. The configuration file for the ETHER_IP TLM is ETHER_IP.LST. The Load button will load the ETHER_IP.LST file from the development system’s disk. The Save button will write the ETHER_IP.LST file to the development system’s disk. The Fetch button will load the ETHER_IP.LST file from the runtime system’s disk. The Send button will write the ETHER_IP.LST file to the runtime system’s disk. After you Send the list of modules or the configuration file, you must restart or cycle power on the SoftPLC in order for the changes to take effect. The configuration file is used to set the debug level, specify which ethernet interface, define local assemblies, declare expectations for target (incoming) i/o connections, and define originator (outbound) i/o connections. The comments in the sample file below explain the format. # Ethernet/IP Driver Configuration for SoftPLC Runtime Software. # and are easy to parse with a programming language. Parentheses are balanced. # The supported grammar is documented in the next several lines of comments. # are never actually used in real configuration statements. # it is a grouping. Only one of the choices in a grouping may actually be used. # used in real configuration statements. # White spaces includeing tabs and newlines (CR, LF, etc.) are all ignored. # Numbers may be provided either in decimal or in hex with a prefix of 0x. #                               ` 6 are optional, indicated with enclosing . #                                           ` the integer bitset. # must have a unique number from 1-65000, called an assembly instance id. # target_role_connections and originator_role_connections which follow. # combination of assembly ids. # my perspective within this network node. # will be made and manageed as a scanner. #  of io_connections, which are all UDP based. #                                           ` precede the 1-3 Application Paths. #                                           ` If used at all, probably just a port path. #   [(io_timeout_mult <4|8|16|32|64|128|256|512> )] `see CIP docs for forward_open. #                                           ` or it can be zero length also. #   [(tgt_config <ASSEMBLY_ID>)]            ` Which assembly is to receive it. #                                           ` my_config will be used. #   [(size_bytes <NUM_BYTES>)]              ` If zero then this is a heartbeat half. #                                           ` my_producing will be used. #                                           ` my_consuming will be used. # end of intro comments and grammar rules. There are 3 Topdoc Loadable Instructions (TLI)s that can be called from Ladder Logic to monitor and control the operation of Ethernet/IP TLM. This TLI is a permissive instruction that evaluates to either true or false depending on whether there are any (io_connections …​) which are in an unconnected state. That means that the output logic to the right of this permissive will be energized when there is some kind of communictions failure. So it acts like an alarm. Additionally, the datatable block given by the Map parameter will be filled with a bitmap containing one bit for each io_connection, and will turn on bits which represent the io_connections which are failed. Bit 0 of the first word at Map represents the first (io_connection …​) in the configuration file, bit 1 of the first word at Map represents the second (io_connection …​), etc. All io_connections across all targets are in this set. The length of the Map block is 128 bits fixed length. This is 128/16 = 8 words. This TLI is an output instruction that retrieves a block of 16 bit words into the Result parameter. Each word in the Result block is a count of how many times the TLM has lost contact with the respective io_connection. Each instance of this instruction may only deal with the io_connections under one target, given by the Target parameter. In the Target STring you should put the same IP_ADDRESS or machine name that you used in the target’s configuration. The io_connections defined within the configured target are implicitly numbered starting with index 0. The IoConnIndex is the start of a consecutive range of target io_connection indices, and will normally be 0 to indicate that you want the first io_connection under Target. IoConnCount is the number of io_connections that you want to fetch starting at IoConnIndex. It is the length of the range, and may not go beyond the number of io_connections given in the configuration file for Target, minus the starting IoConnIndex. You will need a separate instance of this instruction for each target. This TLI is an output instruction that zeros one 16 bit counter word for each (io_connection …​) associated with a particular (target …​) given by the Target parameter. In the Target STring you should put the same IP_ADDRESS or machine name that you used in the target’s configuration. The io_connections defined within the configured target are implicitly numbered starting with index 0.